From his studies of the Olmec culture of Central America, Mike Xu, a professor at Texas Christian Universtity, noticed that some of the inscriptions of the Olmec (called epi-olmec script) resembled ancient Chinese writing. He was able to translate some of this writing as he was familiar with ancient Chinese script. Following his further studies, he wrote a book which he titled Origin of the Olmec Civilization. 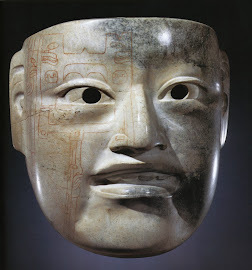 He postulated that the Olmec culture resulted from an influx of Chinese refugees that had fled mainland China following the collapse of the Shang Dynasty about 1600 BC. These refugees brought with them the culture and innovations of the Shang Chinese and taught them to the native inhabitants, resulting in the quasi oriental culture of the Olmec. This goes along with my theory that there was a connection between the ancient, so called Olmec, and the ancient Chinese. The Olmec being equivalent to the Jaredite civilization, which passed through China on their way to the Americas. Now back to Mike Xu. His interest was originally stimulated by his study of some Olmec artifacts discovered during archaeological excavations at the site of La Venta in the Mexican state of Veracruz (La Venta Offering #4). 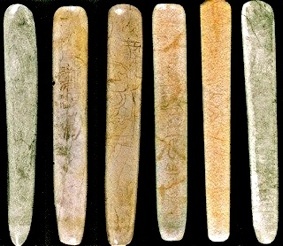 These consist of a number of jade standing figures facing six jade celts with inscriptions on them. The inscriptions on the celts (or polished stone implements) are what initially prompted his research. In spite of his research being well founded and logical, it was unanimously rejected by the leading scholars. Writing in the forward of his book, Clifton Warren, the dean of liberal arts, comments that the book came forth in an “arena of unusual prejudice” (probably an understatement). As a result, Xu not only wasn't accepted as a legitimate scholar, but lost his position at the university and was ostracized by other scholars in the field. Of interest at this point is a quote by Edward Moreno from one of his articles in the Intenet magazine Discover Nikkei. At Texas Christian University—whose slogan is Learning to Change the World—Modern Languages teacher, Dr. H. Mike Xu, had been studying the Olmec script. He concluded that most of its 146 characters resembled Chinese ideograms from the Shang Dynasty (17-1100 BC). Other similarities between Olmec and Chinese—rituals; motifs; tools; body language—also surprised him. After going several times to China to consult Chinese scientists, he sat down and wrote about his findings. Academic orthodoxy became furious, and Xu was sacked. He went to court and won reinstatement, but had to sit at his campus office, thumbs dwindling, forbidden to ever teach again. Unfortunately, this seems to have ended Mike Xu's research into the Olmec. His book has all but disappeared, and is currently out of print. However, for anyone interested in reading it, it is possible to borrow it through Inter-library loan programs. Such loans can be arranged through your local library and a number of university libraries who still have the book on their shelves. Also you can do a search on Google for the book and click on the option "get the book from a library" to determine if there is one in a library near you. The Shang writings as found in China are found in the Olmec world as well. The most frequent and significant symbols refer to sun, rain, water, worship, sacrifice, wealth, land, mountain and plants. 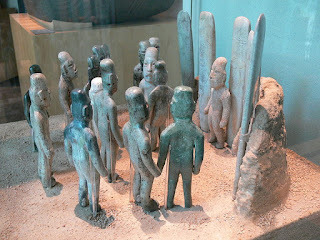 The Olmec religion shared many beliefs with the Shang in the area of ancestral worship, human sacrifice, animal totems as well as the worship of the Sun God and the rain. Their sharing of eagle, dragon/serpent, and tiger/jaguar symbols, as well as the cleft head motif is very significant. The Olmec and the Shang shared the same knowledge of astronomy and astrology as seen in the practice of architectural orientation. Their shared knowledge of Polaris, and the sharing of the Eight Trigram motif in their calendar making is very noticeable. 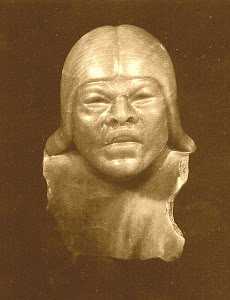 Note: From the La Venta Offering #4 it is apparent that the Olmec practiced cranial deformation (at least among the elite). This is an ancient cultural practice that could be used in tracing the Olmec to their roots. It was practiced among various other groups, but interestingly it was also practiced among the Sumerians. Refer to http://www.ancient-wisdom.com/cranialdeformation.htm for more information.